At a time when three out of four jobs in the fastest growing industries require science, technology, engineering and maths (STEM) skills, more than 1000 students from around the world will participate in a robot-building competition to celebrate and inspire a love of STEM in children. 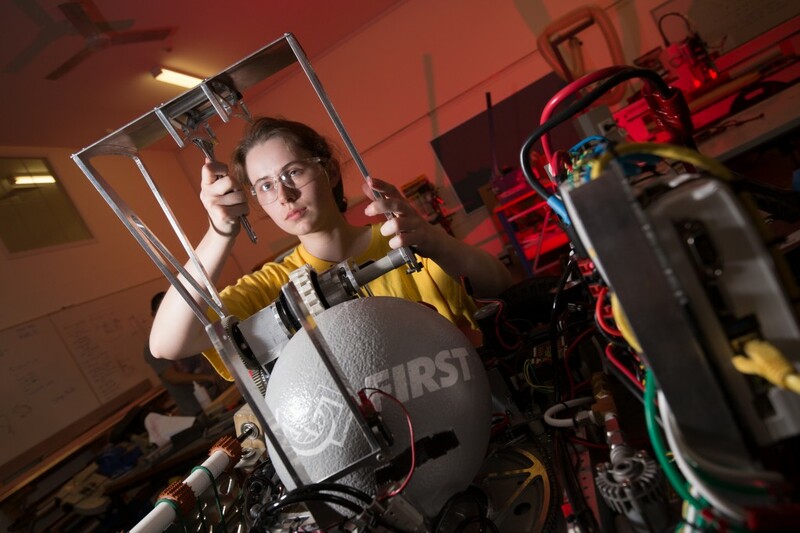 This year’s Australian Regional FIRST® Robotics Competition (FRC) will run from 17 to 19 March at Sydney Olympic Park. It will be the biggest yet, with nearly 50 teams from the United States, Singapore, Taiwan, China, India, and Australia competing to see which robots can catapult boulders and scale obstacles to ‘conquer’ an opponent’s tower. The competition is a culmination of six weeks of teamwork: designing building and programming robots to enter the event. In order to stimulate creative thinking and design, all teams worked with the same construction materials and control system components to build their robot. FIRST Australia Regional Director, Luan Heimlich, said the objectives of the competition stretch much further than realising a winning team alliance on the day. “Our program is designed to guide and support well-rounded scientists, engineers, and tech entrepreneurs. It’s one thing to know how to build a robot that can complete a set of criteria in a game, but we also want to equip these kids to have the skills to lead a team, and to collaborate with their growing network of peers to tackle bigger, real-world issues with the skills they’ve picked up along the way. The competition comes at a time where Australia is experiencing a grave shortage in STEM skills – data from PwC shows that shifting just one per cent of the workforce into STEM roles would add $57.4 billion to the Australia’s GDP over the next 20 years. Macquarie University Vice-Chancellor Professor S. Bruce Dowton said: “Almost half of all employers expect requirements for STEM-qualified employees to increase in the next five years alone. Continued education in this space is vitally important to ensure Australia’s workforce will have the ability to support future industries. Last year through their involvement, major sponsor Google helped to get more under-represented young Australians exposed to STEM through robotics as part of a successful tour of rural Australian schools, allowing an additional 11 school teams from remote and rural locations to compete for the first time ever in the FIRST ‘Robots In The Outback’ tour. Engineering Director at Google, Alan Noble, said they are thrilled with the impact the FIRST Robotics program is having in Australia, inspiring and preparing the next generation of innovators. FIRST (For Inspiration and Recognition of Science and Technology) is a not-for-profit organisation that runs a suite of robotics programs for school students year round. As well as bringing to science and technology the kind of excitement and atmosphere of a sporting or entertainment event, the program also educates students in a fun way, teaching them not only the hands-on building and programming skills, but also the skills to innovate their design, to ‘market’ their work, and to engage with a network of sponsors and mentors.